The Trump administration’s fear-inducing immigration policies could lead to a farm and restaurant labor shortage, greater use of the H-2A visa program, and a climate rife with worker exploitation. Though the strange car ultimately proved harmless, the workers later described the incident—and how fearful they felt—to Kathia Ramirez, the food justice coordinator of a farmworker support committee called El Comite de Apoyo a los Trabajadores Agrícolas, or CATA. While the ultimate effect of the anxiety remains to be seen, several likely possibilities exist, according to the people with whom Civil Eats spoke. As some foreign-born workers retreat from sight, farms and restaurants may have a hard time securing the staff they need to harvest crops and serve meals. Additionally, worker exploitation may proliferate as farmers rely increasingly on the H-2A agricultural guestworker program, known to place workers at a disadvantage, and as workers refrain from speaking up for themselves for fear of deportation. The American food system relies heavily on the work of people born outside U.S. borders, many of whom are undocumented—and living on edge. In fact, 73 percent of the 2.5 million farmworkers planting, cultivating, and harvesting our crops each season are foreign-born, mostly in Mexico. And between 30 percent and 70 percent are undocumented, according to various sources. On the service industry side, of the 12 million restaurant workers in the U.S., 1.3 million, or 11 percent, are undocumented, and an additional 2.6 million are foreign-born but documented, according to the Restaurant Opportunities Centers (ROC) United. In major metropolitan areas like New York, Los Angeles, and Chicago, closer to 45 percent of restaurant workers are undocumented, and 70 percent are foreign born, ROC United estimates. Since deportations have picked up—targeting more varied populations than the Obama administration campaign, including young people registered with the Deferred Action for Childhood Arrivals (DACA) program—immigrants are wary of traveling or appearing in public. This sense of fear pervading the agricultural workforce could severely impact the U.S. food system. An Agricultural Guestworker Program Poised to Grow—And Exploit? Because hiring agricultural workers through the H-2A visa program is expensive, requiring farmers to transport workers from Mexico and supply them with housing and a set wage, many farmers opt to hire from the undocumented population instead. Though the number of H-2A visas issued has roughly doubled since 2011, it’s still relatively small: In 2015, only about 4 percent of farmworkers came to the U.S. through the guestworker program. 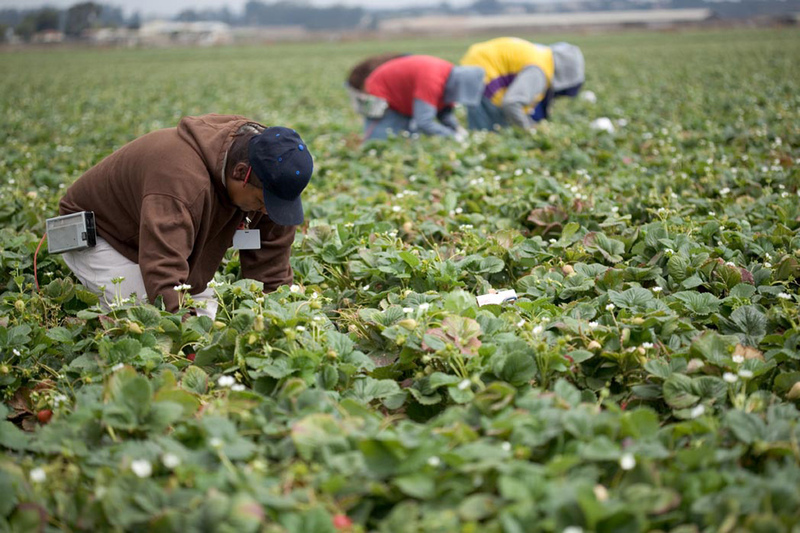 “I think what we’re going to see is that more farmers are applying for H-2A visas,” said Gail Wadsworth, executive director of the California Institute for Rural Studies. If that happens, farmworkers could suffer, say some advocates. First established in 1952 to offset labor shortages prompted by World War II, the H-2A program brings guest workers to the U.S. on temporary contracts to fill positions employers are unable to fill with domestic workers. Because the program ties workers to a specific employer, advocates say it creates the opportunity for exploitation. The Southern Poverty Law Center, in a recent report, characterized today’s guestworker programs as rife with wage and contract abuse, documented discrimination, and on-the-job injuries without effective recourse. Photo credit: Russ Allison Loar. CATA’s Ramirez regularly visits the labor camps at apple, peach, and blueberry farms in South New Jersey to educate workers about topics like the risks of exposure to heat and pesticides. She has noticed many violations of the conditions required by the H-2A program. Workers have reported that their employers have taken away their visas and IDs and forbidden them from leaving the property or making phone calls—a practice that constitutes human trafficking—and sometimes workers do not receive the full wages they are owed, Ramirez said. Additionally, living conditions are sometimes extremely poor. In North Carolina, one of the top states to use the H-2A program, Anna Jensen serves as executive director of NC Farmworkers Project, a nonprofit that connects workers with health information and medical services. Jensen worries that the administration’s discriminatory rhetoric will embolden growers to seal off their contracted workers. On top of the likely expansion of the H-2A guestworker program, Trump’s proposed 2018 budget includes massive cuts to the departments that oversee the fair treatment and protection of the country’s workers, including those on farms and in restaurants. The proposed cuts include a 20 percent decrease in funding to the Department of Labor—which regulates wages and hours and workplace safety and health, as well as the Migrant and Seasonal Agricultural Worker Protection Act and the Fair Labor Standards Act. It also includes a 31 percent cut to the Environmental Protection Agency—which sets worker protection standards for farmworkers and pesticide handlers. Trump also proposed eliminating the Legal Services Corporation, a nonprofit corporation that helps low-income people obtain representation in civil cases. Additionally, Republicans voted in early March to repeal the Fair Pay and Safe Workplaces Executive Order that President Obama signed in July 2014, which requires companies contracting with the federal government to keep and disclose records of on-the-job accidents and fatalities. Meanwhile, agribusiness groups are lobbying the administration to make the H-2A program more beneficial for U.S. employers. And they appear to be getting through: a draft executive order leaked to the press in January revealed that Trump planned to “prioritize the protection of American workers” and ensure the “efficient processing” of H-2A applications. Don Cameron relies on about 125 farmworkers at a time to harvest from mid-June to the end of November to harvest the 25 crops grown at Terranova Ranch. Because his farm cultivates primarily specialty crops—like peppers with the stems removed for use in salsas—much of the harvest requires picking by hand. Unless he can develop a good way to mechanically harvest the crops he grows, Cameron said, he may have to change what he plants moving forward. Ansel Adams documented farmworkers at Japanese internment camps in California. CIRS’ Wadsworth thinks many farmers will respond similarly—moving away from labor-intensive crops and opting for those that are easier to harvest mechanically. “It could be a total shift of production in California,” she said. Restaurant owners, who were experiencing a labor shortage even before Trump took office, are also concerned. Right after the election, the 200 restaurant owner members of ROC United penned an open letter to Trump. On election day in Raleigh, North Carolina, Centro Mexican restaurant chef and owner Angela Salamanca gave her entire staff time off so they could cast their ballots—and even hired a mariachi band to parade them down to the county board of elections. As the sense of fear has grown over the intervening months, Salamanca has tried to continue providing her staff the support they need, even though she too feels frustrated, disillusioned, and sad. But there are bright spots: in addition to closing the restaurant for the Day Without Immigrants, Salamanca brought in an immigration attorney to deliver a know-your-rights workshop, to which she invited restaurant workers from other Raleigh establishments as well, and it heartened her staff to know they actually do have some legal ground to stand on if detained. While she described the Trump administration’s immigration policies as “horrific,” Jayaraman sees “much more than a silver lining” to the situation. For one, she’s seen more people willing to stand up and speak out. ROC United co-led a coalition that successfully called for Andy Puzder to withdraw from consideration for the Labor Department secretary position, and its sanctuary restaurant program and One Fair Wage campaign have gained traction in multiple states. In New Jersey, Ramirez and her CATA coworkers are holding workshops at farmworker camps, health clinics, and Head Start programs to educate farmworkers and other immigrants on their rights if they’re detained. The CATA office has extended their hours to help workers fill out forms designating what should happen to their money, property, and children if they are deported. And, in North Carolina, Anna Jensen and the NC Farmworkers Project hopes to offer de-escalation workshops at the farmworker camps and hold community meetings about new legislation. They’re also looking to build relationships. “Since we can’t predict the future, mostly what we’re looking at is strengthening the networks we have,” Jensen said. Ultimately, Salamanca sees the administration’s anti-immigrant policies—and the sense of fear they produce—as unsustainable both for the food system and society as a whole. Top photo CC-licensed by Michael Davidson.